In 8 Forever, Ryan Callanan aka RYCA will unveil two new bodies of work across two galleries in two cities – ink_d gallery, Brighton and Lawrence Alkin Gallery, London. The works in both spaces are inspired by the artist’s formative influences at age eight, and overflow with references from his childhood in the Eighties. Recurring throughout the work are images and actual examples of the toys collected by the artist at eight years old. Callanan remains a self-styled ‘adult toy collector’ a passion that began when his uncle handed down his Star Wars toy collection in 1989. Today, the artist’s toy collection fills his home and studio and consists of hundreds of pieces. 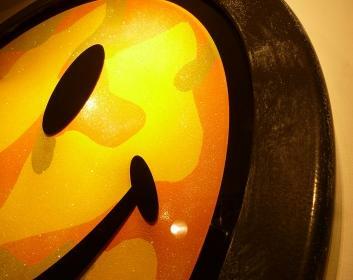 The body of work in 8 Forever also heavy references rave culture (smiley faces, ravers and drug references) a scene that Callanan’s Father was heavily involved in when the artist was eight. At Ink_d gallery, Ryan’s work takes on a different, never-before-seen form; with the space filled with works created by a brand new technique which the artist calls Pressure Painting. Here, iconic characters from the artist’s toy collection including He-Man; Darth Vader and the Mutant Ninja Turtles are placed under extreme pressure and moulded with clear granular plastic to create fused distortions of themselves. Meanwhile in London, at the Lawrence Alkin Gallery, large scale pieces of intricately crafted 3-dimensional glassworks display the artists extraordinary skill within the medium, honed over 15 years as an industrial sign-maker. In fact, examples of Callanan’s work on pub signs surround the Soho gallery on all sides; to the west at The Tottenham on Tottenham Court Rd and to the south at The Cambridge on Cambridge Circus. For the artist’s considerable fan-base which notably includes Norman Cook, Russell Brand and Serge Pizzorno from Kasabian these two bodies of work will be unmissable; with trips to both galleries a necessity. via What’s on / Ink_d. This entry was posted on September 18, 2014 by mptask in Brighton, Ink_d, November 2014, October 2014 and tagged art, art exhibition, brighton, ink next Ryan Callanan, Ink_d, RYCA.